Lincolnshire Open Studios 'Art on the Map' is on again this weekend 1st and 2nd December. 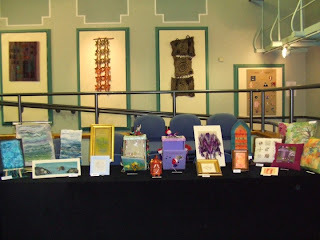 Have a look at the website http://www.artonthemap.org.uk/ for details of all the studios across Lincolnshire that will be open. I will be opening my 'studio' at home in Sudbrooke - would be lovely to see you if you can make it. Email Janet Taylor for directions. 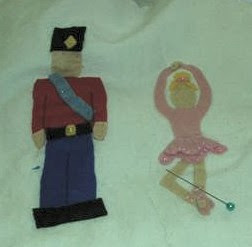 I'll have the embellisher out, so come along and have a go. Jackie is our new IT Rep and has been updating the Branch web pages on the EG Website. 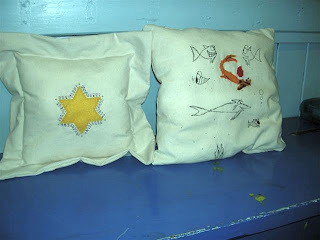 We have quite an active Young Embroiderers' Group at Bailgate. 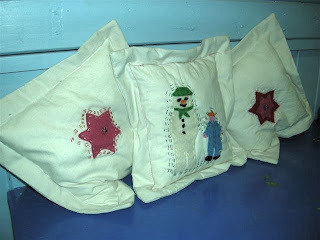 This month they did 'Christmas Kantha' with Norma. They meet alternate months at the Bailgate Methodist Church Hall. Next month they'll be doing some animals and creatures from the Luttrell Psalter with Christine. A Question of Identity - An exhibition exploring passions and journeys through life. This is a body of work that has just returned from a successful exhibition in Ireland. Well worth a look if you're in Newark. It is displayed in a vacant shop unit at the Buttermarket in the market square at Newark. Open 10 - 4.30pm until sat 24th Nov.
Mandy-Jane Patterson is studying for an MA at the Textile Conservation Centre (TCC) Winchester, which is part of the University of Southampton. The University are planning the closure of the TCC in the near future due to funding issues. Mandy-Jane has set up a petition at http://petitions.pm.gov.uk/TCCClosure/, which has been registered at No. 10 Downing Street, in an effort to raise awareness of this matter and hopefully to secure the future of the TCC. If you would like to help save the Textile Conservation Centre, please sign the petition as it could make a difference. There are 1159 names on the petition at the moment. I am going to put a message on the EG Members Forum to help spread the word. 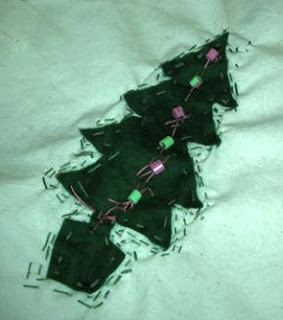 The next LP workshop is on Thursday 15th November (7pm to 9pm) and we will be looking at using trapunto techniques that can be used to give a raised effect to your embroidery. Trapunto is a quilting technique and is also called stuffed quilting. Southwell Minster is hosting a display of embroidered panels celebrating the psalms and saints from 9th November to 14th December. 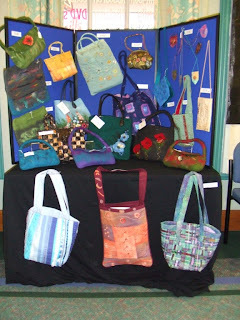 It will include pieces by Hilary Tinley who is the tutor of the Minster Needlecraft Guild. This show covers all aspects of quality stitchcraft including cross stitch, sewing, card making, embroidery, knitting, patchwork, quilting, scrapbooking, ribboncraft, papercraft, stamping, beading, painting, dressmaking, tapestry, decoupage, crochet and many more popular stitch and creative crafts. I have mentioned in the last few meetings that we'll be having a silent auction. This is a method of fundraising we haven't tried before and I've been asked to provide some more information. First of all we need some things to auction! These can be 'things' or 'pledges'. Examples of 'things' - you could donate something you've made - eg a Christmas cake, homemade wine, a covered book, a box, or picture. Or a set of handmade cards. Or it could be a box of threads, beads, fabrics. Or it could be a book on embroidery. Examples of 'pledges' - a pledge is something you could do for someone else. Things like showing someone how to make felt, do machine embroidery, make cards, how to use the computer (from basic email/Internet skills to using design programmes), how to use an embellisher, how to digitise designs for embroidery, how to use a computerised sewing machine, how to ..... the list is endless. Pledges can also be 'things' that you haven't made yet, but will be ready later. Think about the sort of things our members might be interested in and what you can do and make an offer! Just get in touch with me and I'll tell you what to do next. Some tables will be set out with the items being auctioned. If it is a 'thing', hopefully it will be there so you can see it. If it is a 'pledge' there will be a description on a card so you know what you are bidding for. If you want to bid for something you will need to register your name and you will be given a number to use. In a traditional auction, the items come out one-by-one and people bid by raising their hand. In a silent auction, all the items are out at the same time and people record their number and how much they bid on a sheet of paper next to the item. If someone else would like to bid for the item and is prepared to pay more, they put their number and bid on the sheet .... and so it goes on through the evening. If you know what happens on E-Bay, it is a similar process. You can watch the bids going up. At a certain points in the evening we will announce how long is left to bid. When the bidding closes, the person with the highest bid will win the item and will pay Anne. They can take the item home with them. If it is a pledge they will need to arrange a suitable date with the donor. At the end of the evening we'll announce how much we've raised. I hope that has made it a bit clearer - now ..... let's have your offers!!!! 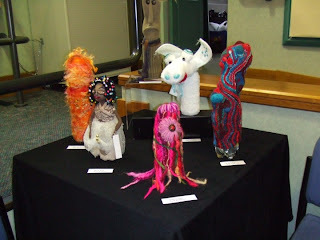 The exhibition has been a great success. Visitors have been impressed with the standard of work and some are interested in joining us. The next meeting is on 30th November and it is a practical evening. Chris P & Chris W will be showing us how to make backgrounds for embroidery. Requirements - dyed jute scrim (or similar) and dyed loose-woven cotton/muslin - apx 12" (30cm) square. Plus co-ordinating or contrasting threads and fabric for weaving. You'll also need general sewing equipment, including a large eye needle with a sharp point. They will be providing kits for £4 if you don't have the materials. I'll also be bringing back the work from the exhibition, unless you want to collect it from me beforehand. 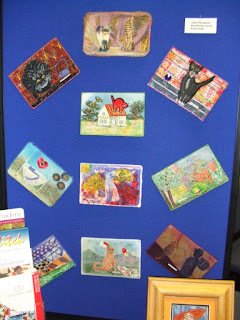 The cards at the exhibition were made by Joan Plummer and they are absolutely fantastic! Twenty of the cards are on a 'cat' theme. Joan has designed the cards around words or sayings that incorporate 'cats' in some way - eg cat on a hot tin roof, octopuss, cat's got the cream etc. She's used lots of different techniques and backed them with pelmet vilene. As with the ATCs, the only 'rule' about fabric postcards is that they should measure 6"x4". If you want to know more about fabric postcards have a look at http://www.squidoo.com/fabricpostcards/#module1500105 there's loads of information. The nice thing about making postcards or ATCs is that you can work on a small scale and they can be quite quick to make. Both formats are becoming very popular all over the world and the concept is based on the picture cards that used to come in cigarette packs or PG Tips tea. 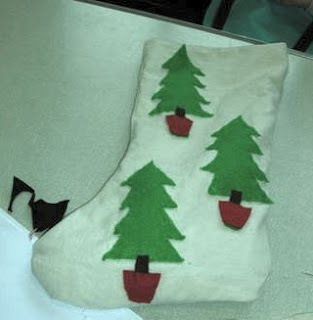 And the idea is to make them and swap them (like we used to do with our spares!) - 'trading' has nothing to do with selling them. Artist trading cards are always 2 1/2 inches by 3 1/2 inches. They are the size of a 'baseball' card and fit into the plastic wallets that collectors acquire. They can be made from anything with embellishments galore, the only other rule apart from the size is that they should be traded and not sold/bought. There are quite a few groups on the internet who trade these cards. 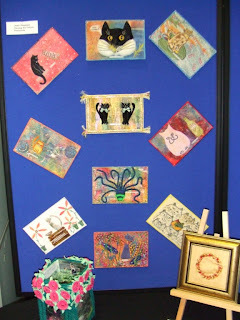 From the Library Exhibition, we have has a lot of interest in how to make ATCs (artist training cards) which can be the size of a playing card or a post card. We put the exhibition up yesterday. Lots of lovely work has been submitted and it looks great. A wide range of techniques and ideas. What a diverse group we are! If you get a chance, please pop in to see us. We will be at Lincoln Central Library on Free School Lane from Tuesday 6 Nov to Sat 10 November. Opening times 10am to 4pm, but on Thursday we're open until 7pm and on Saturday we close at 3pm.